We live in an age in which the form of cities, the ways in which we experience them, the choices they present us with are all in the process of profound and rapid change, driven by the presence of networked information-processing systems everywhere around us. [..] We believe that understanding this layer, the systems that make it up, and its implications for the freedom to move and act is vital to full citizenship in the congested, contested urban spaces of the twenty-first century. We also believe that there’s no better way to develop such an understanding than by walking through the city with open eyes, remembering to look up and down, noting the various manifestations of the network and asking how they operate us. Adam and Nurri have kindly open sourced the concept, and even made a pamphlet on how to run such a walkshop. 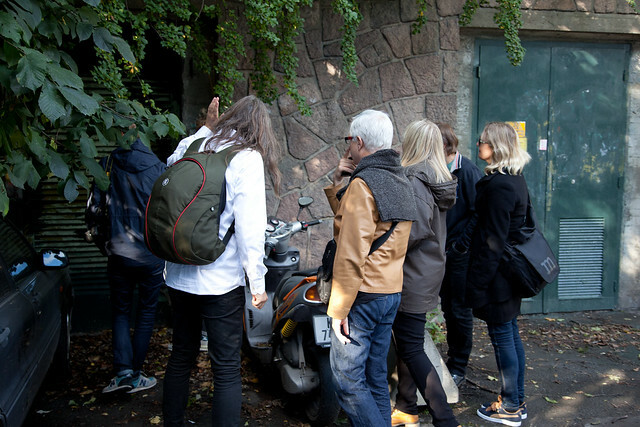 The purpose for me was to get together a group of people – not to necessarily give us any major new insights – but give us all an excuse to set aside four hours for walking, chatting, noticing and discussing the networked city in the context of our own city. We started the day with a torrent of interestingness from our guest of honor: James Bridle. He talked about his projects such as Robot Flaneur and Rorschmap, his fascination with architecture of secret servers and the new aesthetics. Most importantly I think James’ talk gave our walking bit of the event an extra dimension. It reminded us not only to see the direct infrastructural implications of the networks and algorithms, but to also consider the impact on visual and aesthetic popular culture as in retail, services, products, advertising, photography and so on. It stressed for us that we are increasingly living in a robot-readable world. One of the first things that struck us was the sheer amount of infrastructural messiness that’s on every street and building around us, and how good we are at unseeing it, pushing it into the background noise of the street. An exercise such as a walkshops is brilliant at pulling this back into the conscious brain. And when you start to actually see it, you start to wonder what it’s for, who it’s for and why it’s there. 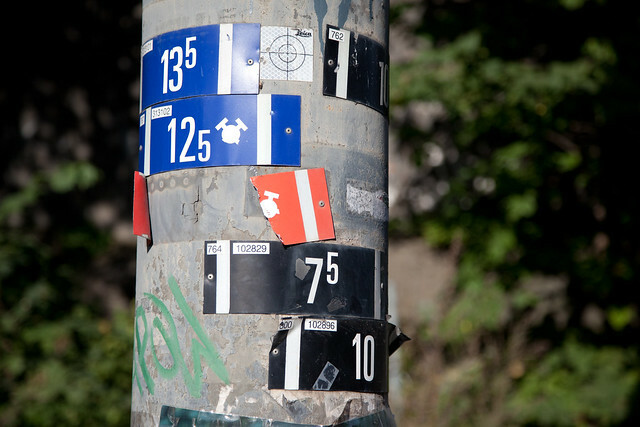 The good old sticker seems to be the brittle glue that holds the networked city from falling apart. In what other way do you communicate about the existence of a location-specific intangible and invisible service? In what other way do you add network-functionality to your parking meter without replacing the whole thing? 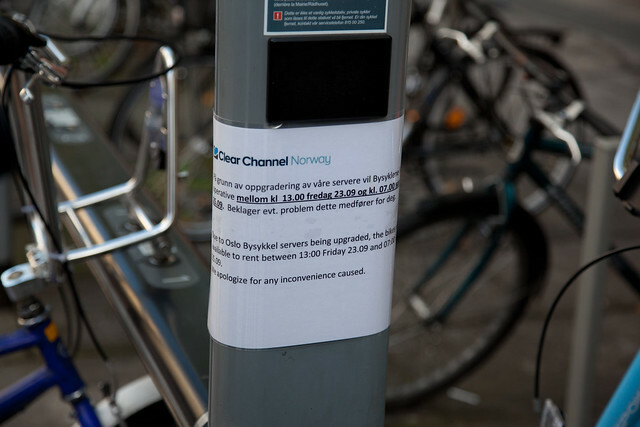 In what other way do you tell people that the city bikes will be unavailable for a day because you are upgrading your servers? Augmented parking meter. 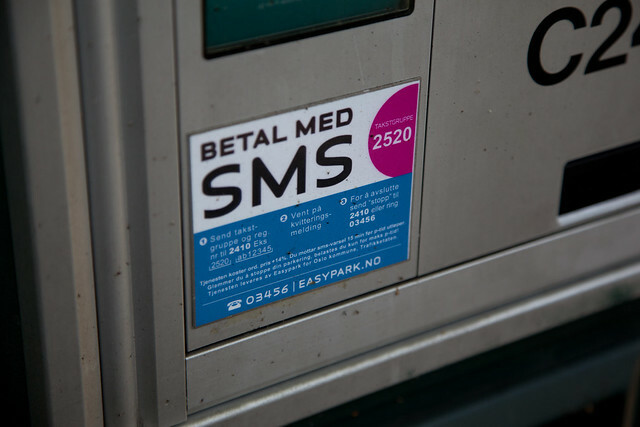 Pay with SMS. Bikes unavailable due to server upgrade. This note basically summed up the whole day for us. It reminds us that we are at the point where networks, services and physical things in the city are so intertwined and amalgamated that upgrades to a server in some anonymous warehouse many miles away, is stopping you from riding a bike to work that day. Thanks to everyone who participated. It was a super day! There are more photos in our pool on Flickr.